Sometimes, no means no. Like, No, you cannot run through the parking lot. Or, No, you cannot take off your seatbelt. Or, No, I will not count to one thousand. Or, No, you cannot drink Mommy’s wine. 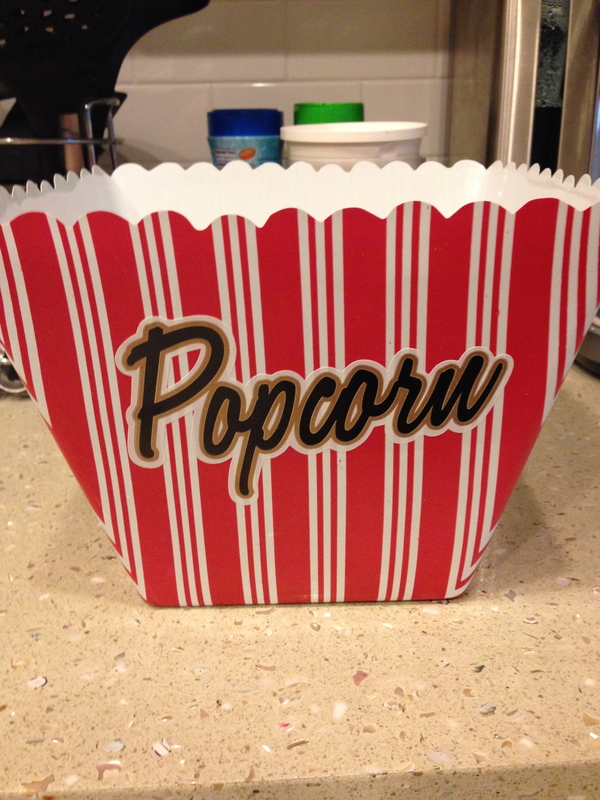 Sometimes, no means: I’m too tired to make homemade air-popped popcorn, so you can have a bowl of Skinny Pop instead. Sometimes no means: You can’t eat the popcorn in a “movie night” popcorn bowl from the party store from your brother’s 5th birthday party that’s sitting high up on the shelf in the laundry room and is most likely very dusty, but you can eat it in this plastic yellow bowl because it’s already in my hand and there are only ten minutes left until bedtime. Actually, it’s almost an hour past your bedtime, which is probably why we’re having this disagreement about which bowl is appropriate for popcorn consumption. You want the bowl hidden deep in the laundry room (although clearly not hidden deep enough), and I want the bowl that’s in my hand, is clean, and can go straight into the dishwasher. Sometimes no means: Why didn’t I just say yes, because then this conversation would be over and we wouldn’t be yelling at each other and your lip wouldn’t be curling and – here it comes, wait for it…wait for it – there wouldn’t be tears squirting from your big, blue eyes and the sound of your crying wouldn’t echo through the house and pierce my tired ears and convince young people within a one mile radius of our house not to engage in sexual activity out of fear of parenthood and I could worry about other things like mashed or roasted potatoes for Thanksgiving and the carpet in the family room really needs to be burned steam cleaned and I have to get a flu shot. Instead, I must fight with you, and I must win, because as hard as it is to say “no” right now, it will be a lot harder to do when you’re a teenager who talks back to me and has – gulp – keys to the car. Because if you can’t handle “no” now, you’ll grow up to be a person who’s easily disappointed and too fragile to handle the lemons that life will inevitably throw in your face. Or, you’ll be an entitled jerk. You can have Skinny Pop in this yellow bowl, or you can have nothing. I wonder what it would be like to spend an entire day saying “yes” to you. I have a feeling we’d end up on a container ship bound for Taiwan holding a “Happy Birthday” balloon from Publix and a plastic bag filled with shiny rocks. This is your choice to make. You can have Skinny Pop in this yellow bowl, or you can have nothing. It occurs to me that sometimes I say “no” when I should say “yes,” because there are so many really good – no, wonderful – reasons to righteously shout No! from the rooftop, like when your “helping hand” is in the direct path of your scissors or when you want to draw on the kitchen table with a Sharpie or when you ride your bike into the middle of the street. But instead, I waste my “nos” on things like digging holes, playing with water inside the house, and eating popcorn from a dirty, hard to reach, “movie night” popcorn bowl an hour past bedtime. And I surrender, because if I just say “yes,” which I probably should’ve done in the first place, this nonsense will end. You will stop squirting tears and hurting my ears, and you will eat your popcorn while I recoup for our next battle, which will most likely happen as a result of: No, you can’t wait until tomorrow to brush your teeth and No, I won’t read another book. Sometimes no means: For the love all that is holy, eat your popcorn in whatever freakin’ bowl you want, but don’t ask me for a refill because the answer is No. wonderful post. I agree, No at this stage is *hard* (partly because she has dad wrapped around that finger pretty tight), but it’s best, because I too will hate to have that fight when she’s older…learning the value of no when she’s only three is heartbreaking for me, but best for her! Mom. Writer. Dance teacher. Expert grocery bagger. Wouldn’t want to be anywhere else, but like the little bunny in Margaret Wise Brown’s classic book, I sometimes want to run away. He’s either an artist or a madman. Clean Up On Aisle Five!